A protest that disrupted production at a Land Rover factory in the West Midlands has ended with the arrest of 15 Greenpeace activists. Some 30 members of the environmental action group breached security at the plant in Solihull on Monday morning. 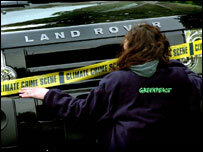 Greenpeace said the action was in protest at what it claims are the "climate-wrecking" emissions from Range Rovers, Land Rover's premium model. Land Rover said only a "small part" of the plant had been affected. The protest came to an end at 1500 GMT after campaigners who had handcuffed themselves to unfinished vehicles on an assembly line at the factory were cut free by police. West Midlands police said on Monday evening that they were questioning 15 people in relation to the incident. A number of senior Greenpeace members are understood to have been among those arrested. "We have arrested some men and women on suspicion of aggravated trespass," a police spokesman told the Press Association. "The action taken by Greenpeace... is both regrettable and damaging - Land Rover is a leading British business and exports over 70% of its production, and contributes significantly to the country's wealth creation," a company spokesman said. He said Land Rover, which is owned by US giant Ford, employed 11,000 staff and supported another 50,000 jobs in the supply chain. According to a Greenpeace statement, its members "used safety shut-down buttons to cut off power to the assembly line" before chaining themselves to the production line at 0600 GMT on Monday. Greenpeace said that although "climate change is the greatest threat the planet is facing" Land Rover "continues to make gas-guzzling vehicles, most of which will tackle nothing steeper than a speed bump". "Making cars like this for urban use is crazy when 150,000 people are dying every year from climate change," said Greenpeace's Ben Stewart. "Range Rover do less miles to the gallon than the model T Ford." However, Land Rover said it took its responsibilities to the environment "very seriously". "We find many of the claims made by Greenpeace both misleading and inaccurate," the Land Rover spokesman said. He said most of the factory was "generally running as normal", with one production line affected. The Transport and General Workers' Union (T&G) criticised Greenpeace's action at the Land Rover plant, describing it as "insensitive and potentially dangerous". "They [Greenpeace] ought to think through the consequences of hitting production at a difficult time for the industry and for the people of the West Midlands, who only recently have seen the closures at Jaguar's Browns Lane plant and mass redundancies at MG Rover," said T&G regional secretary Gerard Coyne.